Umm how do you guys choose which server to play on? I finally unlocked my AS-20. 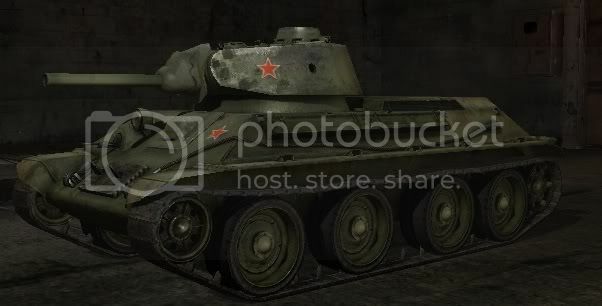 Its gun is the same gun as in the stock KV-1 and T-34 a 76mm. You can only choose which sever by either d/l US client of the EU one. Ah Okay Thanks . I'm having a blast with my T34 now. I'm on US server. If your on the US Server you can stalk the Bay12 channel, not many people from Dwarf Fortress play it so its empty but I'm always in it when I'm on. Also make sure your playing these next couple days, your first battle with each tank for the next couple days gets 5x XP. Would love to play this game but the ****ing download install for the US server is always corrupted...wtf? Annoying as hell as I can only really try it for a month while I'm home.. Thanks to VE day special my T34-100 now is equipped with full 3 modules: Shell rammer, Improved ventilation, and Telescopic binocular. I'm keeping my T34-85/100. The reason I do not put the modules onto my T-43 though it already has a rammer on it, is because the T34-85/100 is a much better credit farmer. oh, and I want MY PzKmpf VI TigerI BACK, DAMMIT. Sold my VK 3601 and got a tiger 1. Hunter: "I'm a little KV, short and stout...watch my shell bounce off a Kraut." Oberon: "When it comes to battle hear the tank crew shout, We're done for, everyone bail out!" Last edited by Oberon; 05-24-2011 at 02:14 PM. Yay, i have finally gotten my goal tank!!! I'm halfway through unlocking and buying the T-54.